At NightGear we can’t stress the importance of workplace safety enough. We work to provide a comprehensive array of high visibility work wear. We supply only the best brands in the industry and deliver only the highest quality products. Our su ppliers include Reflexite, illumiNITE, and Amphipod among other highly-rated manufacturers. 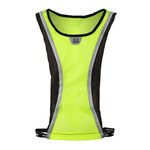 We are the Top-Rated National supplier of high visibility work wear on the internet. According to the Bureau of Labor Statistics, 130 roadside construction workers were killed on the job site in 2012. Of these deaths, 67 percent were fatally injured when struck by a vehicle. Many of these deaths might have been avoided with proper workplace lighting, and perhaps, high visibility work wear. The National Cooperative Highway Research Program also shows in their Traffic Safety Evaluation of Nighttime and Daytime Work Zones that “nighttime work zones have traffic-related crash rates up to three times higher than daytime work zones”. Canadian workplace research firm, Institute for Work & Health’s study has found that those who work night and evening shifts are at higher risk of injury. Reduced visibility in certain work atmospheres contribute to on-the-job accidents and injuries annually with a high percentage of these accidents being avoidable. With the best and most reliable workwear and safety gear, we want to be your choice when it comes to outfitting your staff, loved ones and even yourself on the work site. If it’s reflective, we’ve got it. Plus, we have a broad choice of safety lights, reflective tapes, bike cycle light systems and more. Day or night, its NightGear.